Leaving the beautifully appointed headquarters of Sunrise, we head down with its majority shareholder Herbert Baum to check out Irimari on the water just a few hundred yards away. ‘I’m certainly still enjoying the process of yacht building,’ Herbert says as we pull up to the dock. ‘Though it’s a long process, for a ‘non-native shipbuilder’ to see designs and metal plates transform into a finished yacht is so incredibly satisfying.’ Herbert’s enthusiasm is infectious as we admire the profile of MY Irimari as she sits shimmering on the dock. Angular lines meld with the softer dome of her superstructure with enough juxtaposition to avoid complete masculinity and create an androgynous aesthetic. From the dock we noted the oversized portholes on the lower deck are exaggerated even further on the main deck, hinting at spectacular views from the on-deck master staterooms that made us eager to explore further. As Irimari was berthed alongside, we boarded via the starboard shell door that lowered to create a huge over-sea terrace and revealed an open-air waterfront gym. Small details like the heated mirror in the accompanying head to prevent fogging indicate Sunrise’s particular attention to detail. Occupying center stage of the engine room itself are the twin MTU 12V 4000-series M63 power units, driving Irimari to a top speed of 16-knots. Carefully arranged around the remaining space to allow easy access are supplementary systems like the triple GMPP 220kW generators and an 110kW emergency generator from the same company. Making our way up into the cockpit we take a moment to check out the decking, only to discover it is not teak, as it would appear to the casual observer, but a resin compound that mimics teak. ‘We tested several different deck options, including real teak, synthetic teak and this compound,’ explains Herbert. ‘We discovered that this solution remains coolest when exposed to direct sunlight, is easiest to maintain and is a very cost-effective method.’ From the oversized cockpit one enters… OK, before we enter the main salon and cover the yachts interior I need to make one thing clear. Throughout the remainder of the feature you need to take it as read that the interior proportions of Irimari are like nothing else you’ve experienced on a yacht of this length. The owner’s suite in particular is so vast that, unless one is chronically claustrophobic and usually resides in a stadium, I really couldn’t fathom why one would need a larger space. Anyway, in the generously proportioned salon the surrounding scenery pours in through the floor to ceiling glazing and one can only imagine the impact when the yacht is anchored in a more salubrious and scenic environment. 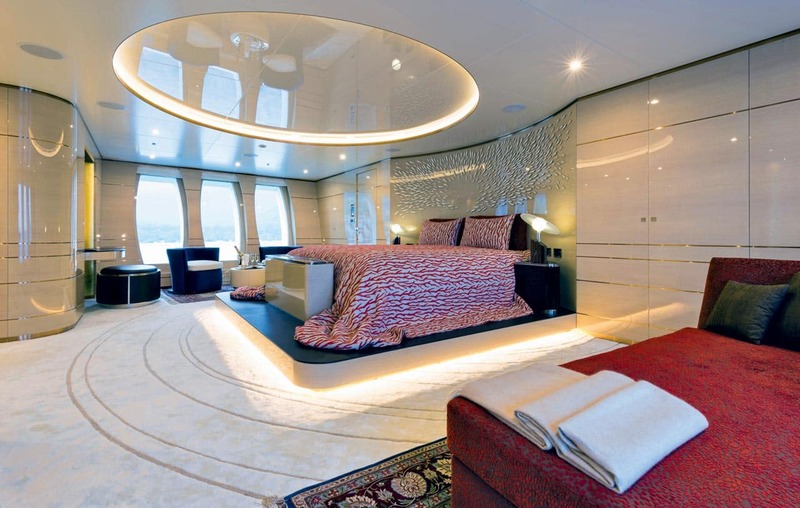 Guest accommodation on the lower deck is arranged around the central lobby with double cabins to starboard and twins to port. The twins are convertible into doubles by sliding the beds together and both feature Pullman bunks, making it a versatile arrangement ideal in charter situations. The level of completion in the guest cabins is excellent and demonstrates quality and forethought with high-end fittings. Moving up the bridge deck we once again find the level of facilities one would expect on a yacht of considerably longer length. 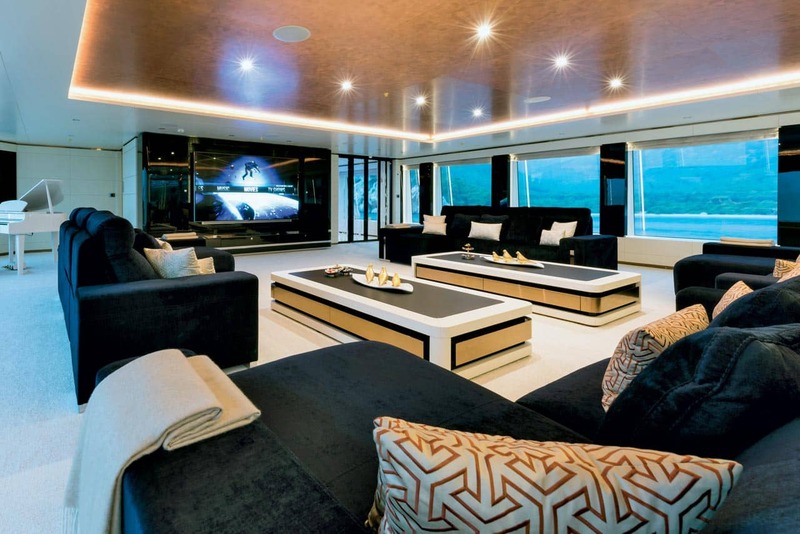 Aft of the main deck one finds Irimari’s upper salon and cinema that again features floor to ceiling glazing. When the party really gets going however, the aft deck terrace with its large bar, al fresco dining and wide-open space with deep comfortable deck furniture is the place to be, before perhaps heading up to the sundeck. The sundeck is… well, of Irimari proportions! Subtly divided between five different zones the entire compliment of guests, and their guests, can find space to sunbathe, dine, swim, lounge, take coffee, shower, belly-up to the bar or flop on a sunpad–all at the same time. With access behind the bar directly into the crew access that runs from the main to sundeck on the portside, service has been carefully considered on this yacht too. Happily, concealed under the foredeck, Irimari carries two personal watercraft, two SeaBobs and the rescues tender to compliment the primary tenders found in her garage. While sitting on the sundeck I muse over Irimari’s interior. While the completion level is uncontestably to a very high standard and some of the details like etched glass, cross-stitched leather panels, copper inserts, lighting and the screens in the stairwell atrium are both innovative and truly enchanting, it is probably fair to say that it doesn’t meet the uber-decadent feel of extraordinary yachts like Kismet, Solandge and some of the launches by Oceanco, Heesen and Feadship. Having completed our tour I asked Herbert what were the major challenges and advancements Sunrise had made as a shipyard in the build of Irimari and he was happy to fill me in on some detail. ‘In engineering terms the bow thruster unit we used on this project was new for us as it is the Epod system, so the electrical motor is inside the hub itself. This system is considerably quieter and the water around the unit absorbs vibration. It all helps moving forward as our next project, Hull 561, is the 187’ (57m) diesel-electric, so in one way the bow-thruster contributed experience in preparedness for that. Finally, the huge amount of full height glazing on Irimari required engineering solutions we’d not encountered before on this scale and these create challenges too.’ As we leave Irimari, Herbert joins me in taking one last glance back at her as the sun sets over Sunrise’s latest launch. ‘You know,’ sighs Herbert almost ruefully, ‘it is times like this I almost regret not owning my own yacht again.’ It was a sentiment we shared. If owning Irimari were an option, it would certainly be one we’d consider seriously.